This recipe is from a Women’s Weekly Let’s Go Greek supplement. I tend to think of kebabs as mainly being cooked on the barbeque, but this recipe cooks them in a pan and then the oven with the marinade poured over at the end. It makes them an all year round feast, not just for summer barbeques. 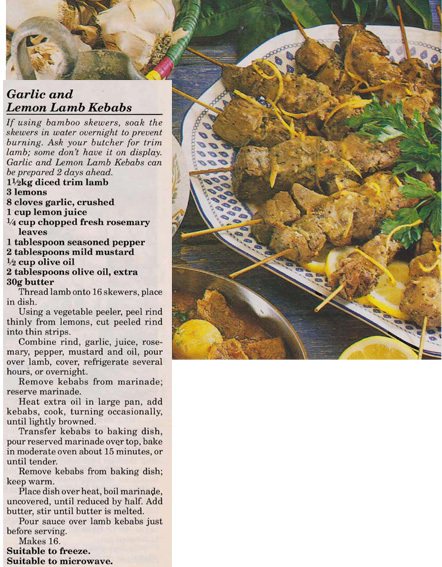 This entry was posted in Lamb, Main Dishes, Uncategorized and tagged 1990s, garlic, garlic and lemon lamb kebabs, lamb, lemons by bebsrecipes. Bookmark the permalink.